My Goldberg Skylark – A love affair ends in tragedy! My Carl Goldberg Skylark ARF… brand new in May of 2006… powered by a Magnun 61 4-stroke. A love affair ends in tragedy! 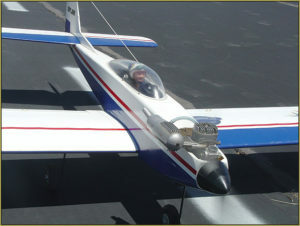 I purchased my Goldberg Models Skylark ARF model from Tower Hobbies back in early 2006. As I remember, it was $149.95. It was a pretty ARF with no flaws… nice covering with no loose edges or wrinkles. It went together easily. I used the cheap-looking hardware that came with the kit… simple thin sheet-metal threaded clevises that twisted onto the threaded control rods… nylon control horns and CA hinges. This was the pilot’s FOURTH Assignment! 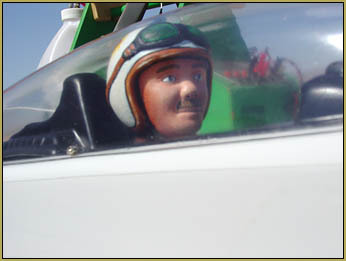 The Goldberg Skylark came with no pilot figure. 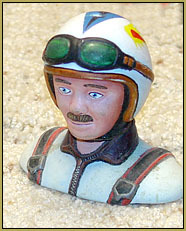 I used the head of a pilot that my son had painted for me back in 2000. At the time, he had been assigned to a World Models low-wing trainer. THAT model flew very well… but, even so, after about three years of flying it, one day I stalled on takeoff and destroyed the plane; smashing the wing and fuselage. The pilot survived! In 2005, after I moved here, to Kingman, I bought a China Models P-40 Warhawk model. 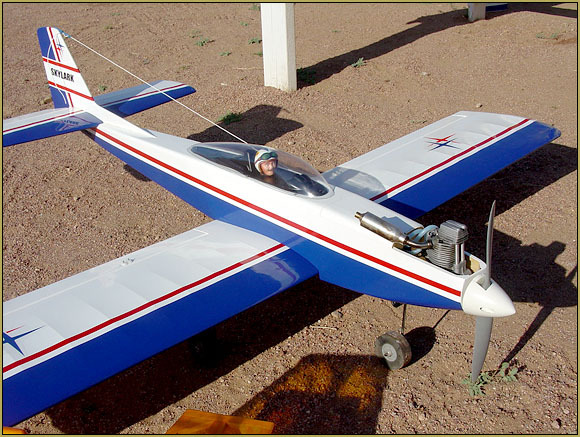 It was a beautiful model with fiberglass fuselage and built-up sheeted balsa wings… and a wonderful pre-printed covering material that made the model look “real”. 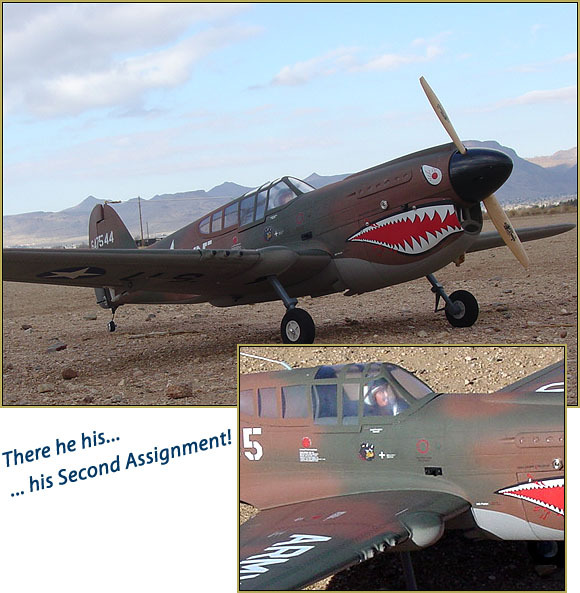 My China Models P-40 Warhawk… .61 Magnum 4-Stroke… My pilot’s second assignment! 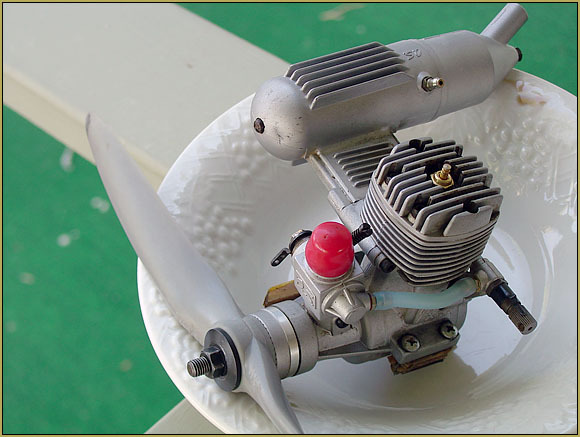 I powered that model, rated as a .40-sized model, with a 61 Magnum 4-stroke… It took off with good speed… but crashed on its maiden flight… after several passes, overhead, I slowed for landing and lost control in a stall as I banked on the downwind leg… it simply fell out of the sky. The wing was split; the fuselage shattered. This man’s second assignment ends in disaster! … but the pilot was unharmed… not a scratch! … Stupidly, I purchased a second China Models P-40 Warhawk… and THIS TIME powered it with a Tower .60 2-stroke… LOTS of power… flew fast… I got in THREE flights before the engine quit at altitude and the model dropped like a rock!… I still have a few pieces of it kicking around here, somewhere! 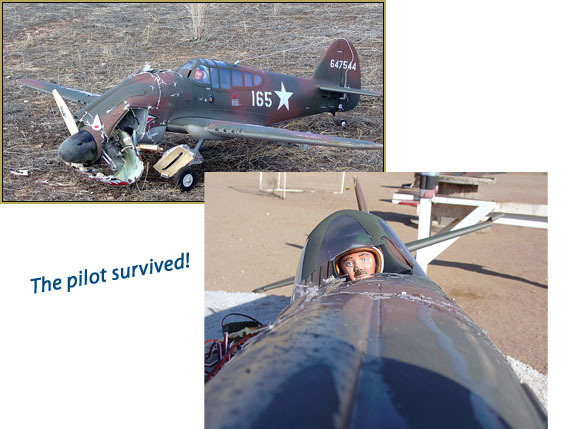 … and… once again… the pilot survived. So I pulled the Magnum motor and installed my trusty OS 46 FX that I had been flying for years… in my original Tower Trainer and in that World Models low-wing sport trainer. In May of 2017, my Skylark is ready to takeoff! Wow! 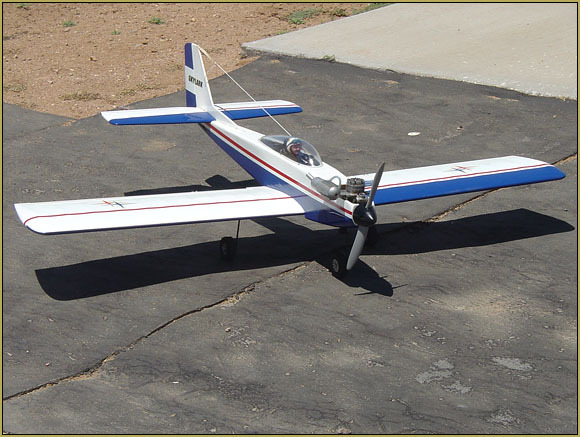 … What a wonderful combination… the Goldberg Skylark and that 46 FX with an APC 11-6… power, command… strength… that model now flew better than I could fly it! 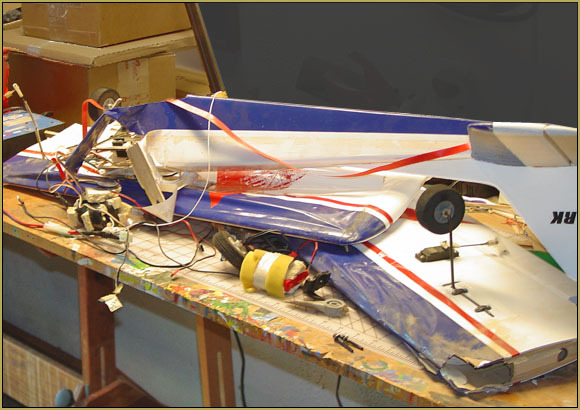 Sometime in 2012, I got the bright idea to add “flaps” by putting one aileron servo into Channel Six and mixing 1 and 6 as Flaperons. … That didn’t really work very well. For one thing, I had the Flaperon control on a rotary knob and so could rotate the knob counterclockwise for negative flaps… both ailerons “up”! So I modified my transmitter with a removable “stop” that did not allow the knob to rotate into that negative-flap position. The remaining servo travel for DOWN flaps was minuscule… almost no flap-action, at all… So, after playing with that idea for a couple of months, I forgot about it. TRAGEDY in May of 2017… I blame that pilot! 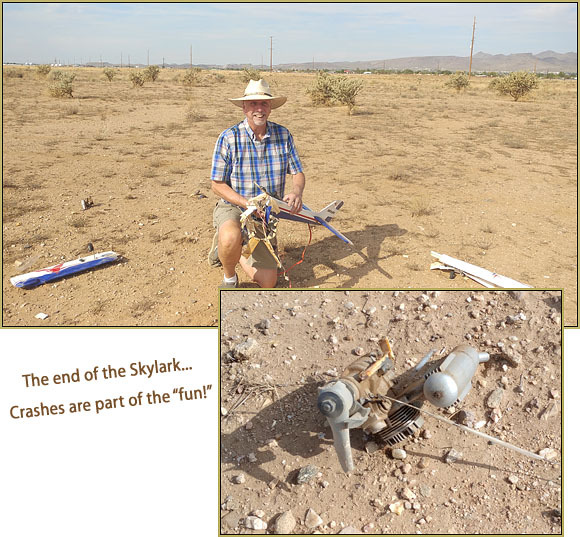 I was out for a leisurely flight with my Skylark when, at high altitude above mid-field, I lost control of the model! It simply seized-up, reminding me of a dead bug, as it blasted straight down at full throttle. I yelled-out to let others know that I had lost control! … and the model hit the dirt mid field about 20-yards out on the other side of the runway. Ka-BOOM! … That PILOT figure! … I have only crashed a few planes in my time… and THAT pilot has been in FOUR of them! … and he survived, again! At home, I dumped the skylark’s remains onto my worktable. 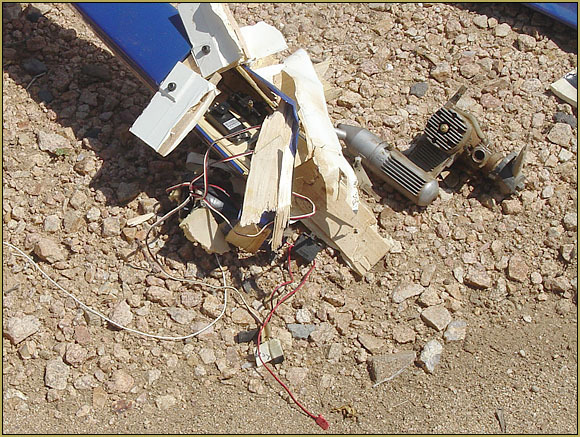 One wing was bashed and bent… the OTHER was a Mono-Kote sack full of wood chips and shards… just a limp bag of scrap balsa with a long stick poking out that had been the main spar. One of the landing-gear wheel hubs was broken! I carefully cleaned the engine with alcohol as I disassembled it… removed the carb, the muffler, the backplate… being careful not to roll the motor until I was sure that all the dirt was out of it. I oiled and reassembled… and ran it on my motor test stand. … it seems to be fine! The Goldberg Skylark… a Favorite… R.I.P! ← Build Google and Yahoo Awareness of our Site! Nice story Eric, sorry been under the weather here will be out as soon as I can. Eric, Your Skylark story was great. Probably everyone who’s flown for a while had a favorite, and the loss lingers. Ask Ben about the Funtana his brother sold me, Ben was not able to get it at the time. I too had a signature post take off roll and I still miss the plane. Now I’m learning from Ben, go figure. Youth was a fun thing, learning came easier- however- time being my own as an old man is pretty darn awesome too. Rick, sorry hear you’ve been under the weather. Missed visiting with you, hope you feel up to fly time again soon.